Eating as little as a quarter of an ounce of chocolate each day -- an amount equal to about one small Easter egg -- may lower your risk of experiencing a heart attack or stroke. The heart is an incredibly powerful organ that works constantly, without ever pausing to rest. Unlike other types of muscles, the cardiac muscle never gets tired, but relies on a steady flow of oxygenated blood to keep working. In one day, the heart transports all of its blood around the body about 1000 times! But the cardiovascular system is actually made up of a complex network of body parts, including the heart, blood vessels, the sinoatrial node and other smaller components-- all of which are key to the functioning of circulation. In order to ensure that the cardiovascular and circulatory systems are functioning to the best of their ability to enable healthy blood pressure, it’s important to take care of all of these components, and to improve and support overall cardiovascular health. High Blood Pressure has always been an issue for me. With Hypercet, I've been enjoying natural support for months. Hypercet has just been great for me! It's such a relief to know that I now have support in maintaining my blood pressure levels. Both me and my husband have had issues with our blood pressure for years. It's great to know there's a natural supplement for us! Hypercet is a 100% natural, non-addictive herbal remedy formulated by our team of natural health experts. 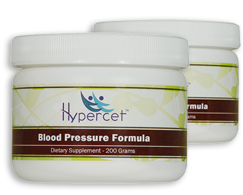 Hypercet has been used for many years to safely support health and systemic balance in the cardiovascular and circulatory systems.